The Burning Amp Festival happens every October in San Francisco. Do-it-yourself audio enthusiasts from all over gather to listen to talks and equipment demos,show off their projects, and rub shoulders with the rich and famous. Having a very large collection of audio parts and diminishing storage space, I seem to have fallen into the role of Santa Claus there, distributing components and cheap advice, with white hair, beard and a large elf (Colin Pass) to add verisimilitude. This year we also brought a batch of unfinished amplifiers - chassis, connectors, transformer, power supply capacitors and Mosfet output stages. These were originally intended to be test beds for designs, but I ended up using the First Watt package for this purpose. My fellow pack rats will appreciate not being able to put something to use, but refusing to throw it away. Finding a good home for these things is an excellent solution, but with it comes the burden of responsibility. As we were handing these out, it became apparent from the glazed eyes of the recipients that a suitable design for their use was a requirement, so the notion of the Burning Amps was born, a series of Class A designs which run fearlessly hot in the pursuit of quality amplification. Five varieties of stereo chassis were given out. There were all N channel Mosfet output stages with either 8 devices per channel or 12 devices per channel. There were complementary (N and P channel) Mosfet output stages also with 8 or 12 devices. There were even a couple of amplifiers with complementary bipolar output stages. This array provides for a variety of approaches, and here we will address the “all N channel” amplifiers. The next piece will work with the complementary Mosfet output stages. After that, we will explore some other possibilities. A modular approach will serve us in our initial efforts – we will start with isolated versions of output stages and front ends. This amplifier has a voltage gain stage which uses matched P channel Jfets to differentially accept a balanced or single-ended input signal. Following the Jfets, an N channel Mosfet provides single-ended voltage amplification controlled by a local loop. 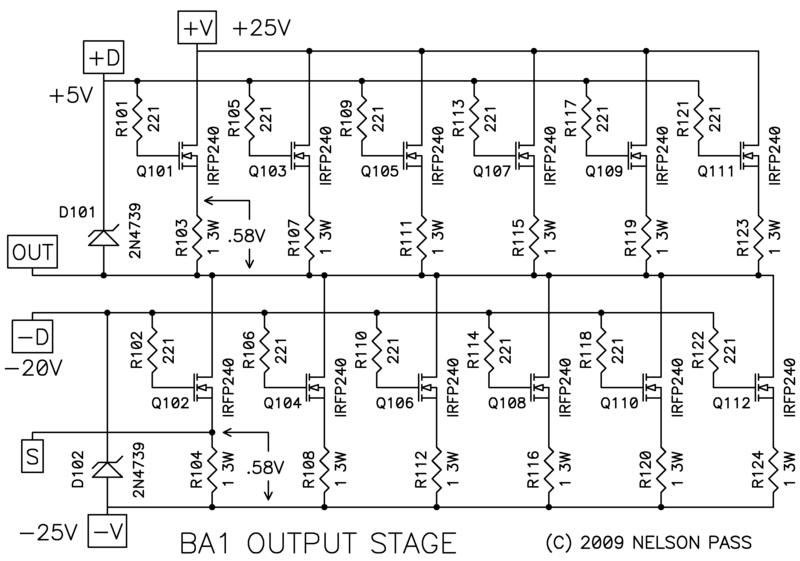 The output stage is a single-ended Class A output follower stage, biased by a large constant current source. We will be operating this output stage au naturale, outside of any feedback loop, and so we will put some emphasis on its intrinsic performance, and the best way to get that out of Mosfets is to run lots of bias current through them. To emphasize the low order nature of any distortion, we will also run the output stage in single-ended Class A, which gives the lowest order harmonic content, primarily 2nd order. The result is a very good sounding output power circuit which is perfectly happy to run without a front end, and if your source has a high output level you can dispense with the front end altogether. With such an output stage, we only need a simple front end, something that won’t get it the way or add significant distortion of its own. Since the Burning Amp chassis has both balanced and single-ended input connections, we want the input system to be comfortable with both types. 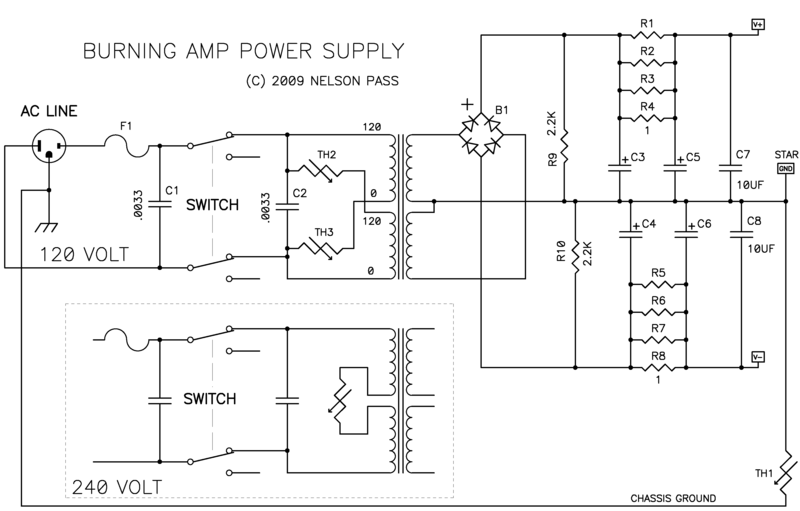 Here is the basic schematic of the power supply. This is essentially identical to many of the power supplies found in earlier articles such as the Zen series and the First Watt amplifiers. The components are fairly ordinary. As the typical Burning Amp will dissipate more than 300 watts, the transformer wants to be rated at least twice that. The diode bridge is 25 amp at 200+ volts, and you can use ordinary or fancy high-speed bridges as you please. There were a variety of transformers given away with these chassis, and our goal is to have approximately +/- 25 volts on the supply rails. Voltages from 18 to 30 volts are acceptable, and for transformers with secondaries much higher than 20 volts AC, operation using the primary taps in series as shown may reduce the secondary voltages to the desired levels. C3 through C6 are your standard high capacity power supply capacitors. The “long” Burning Amp chassis with parallel output devices “6 deep” accommodates four such capacitors, the “shorter” chassis holds two. I recommend that the owners of the “short” chassis to find a way to mount two more capacitors at the front of the amp for C3 and C4. You will also note 10 uF film capacitors across the supply lines. You can delete these, but remember that the prototype used them. All the resistors in the supply are 3 watt or higher types, and R1 through R8 are used to form an RC filter to reduce the supply ripple on the second set of capacitors. Because this output stage is intended for more than one project, a modular approach is being taken, and we will consider the output stage by itself. Figure 2 shows the schematic of the “6 deep” output stage. The “4 deep” output stage is achieved by deleting two pairs of output devices and the associated resistors. All the parts are numbered between 101 and 199. 0.1 volts or so at 500 mA or so. By itself the output stage has fairly impressive performance: The noise is 30 uV, the input impedance is 49 Kohms, and the damping factor is 33. Here is the distortion vs output for this stage at 1 Khz into 8 ohms. Here is the distortion waveform, a nice second harmonic, at 1 watt, 1 Khz into 8 ohms. Here is the frequency response at 1 watt into 8 ohms. As with the output stage, the front end needs good stand-alone qualities. Besides accommodating single-ended and balanced inputs, we want a range of potential voltage gain figures, the ability to swing the output stage rail-to-rail, and performance that will not significantly degrade the stand-alone performance of our output stage. This front end circuit also includes parts that provide bias voltages to both the positive and negative halves of the output stage. All the parts are numbered from 201 to 299. Q201 is biased by a constant current source formed by Q202 and R205. Q202, an N channel JFET 2SK170 with Idss of about 10 mA, is operated as a constant current source by simply attaching the Gate pin to the Source pin. If you don’t have a 2SK170 with the 10 mA Idss, you can parallel two lesser value parts. The 10 mA figure is not critical, and potentiometer P201 provides flexibility on the value. R205 takes up some of the dissipation that would otherwise be found in Q202, keeping it within dissipation spec. As shown on the schematic, typically you will see about 10 volts across this part, reflecting the 10 mA current. R201 through 204 form the balanced inputs networks. R201 = R203 and R202 = R204, and the gain is R203/R201. Compensation capacitors C201 and C202 form the high frequency roll-off for the gain, and while C201 is not strictly essential, it helps to retain the balanced input common mode rejection figure at high frequencies. If you are interested in higher gain figures, adjusting the values of R201 and R202 is a good place, as it minimally disturbs the frequency compensation. When operating the amplifier with a single-ended (RCA) input, the negative input is shorted to ground. You can use dual input connectors, RCA and XLR with the hot RCA connected to pin 2 (+) of the XLR and RCA ground to pin 1. Pin 3 is the (-) input, and can be connected to pin 1 on the XLR for single-ended input. The output signal from the input JFET appears across P201 and drives the Gate of Mosfet Q203 which provides the bulk of voltage gain for the front end. P201 provides adjustment against the expected variations of components in the front end and is used to set the output DC figure of the front end. You will note that no “lag” frequency compensation is employed. The Drain of the Mosfet Q203 is biased with about 15 mA of current provided by the series 3 watt resistor values of R208 and R209. On the Source of Q203 the gain is degenerated by R207 at 100 ohms, limiting the gain and improving the linearity and bandwidth. The point between R208 and R209 is “bootstrapped” from the output of the amplifier through C208. In many designs a constant current source would be employed here, but this approach is not only simpler but provides voltage drive greater than the positive supply voltage so that the maximum output of the amplifier gets as close to the supply rail voltages as possible. levels that it becomes the clear choice. You will note that a RC networks appear between the output node of the front end and the input of the output stage. C203 rolls off the low frequency response at about 0.3 Hz and I chose to use a 10 uF polypropylene type here, as the only capacitor in the signal path. Strictly speaking you do not have to use this capacitor, but it does make adjustment and long term DC stability very easy to achieve. Without it, you will be using P201 to adjust the output offset, and there will be considerably more drift. C204 and R215 form a high frequency pole at the output of the front end and this cleans up the square wave response at very high frequencies by simultaneously loading the front end and filtering the output above 200 Khz. Assuming you use C203 as recommended, you will also want the positive bias network consisting of R212, R213, R214, Z201, C209, and P202. C203 and all these parts are absolutely essential if you decide to use the output stage as a stand-along power buffer. 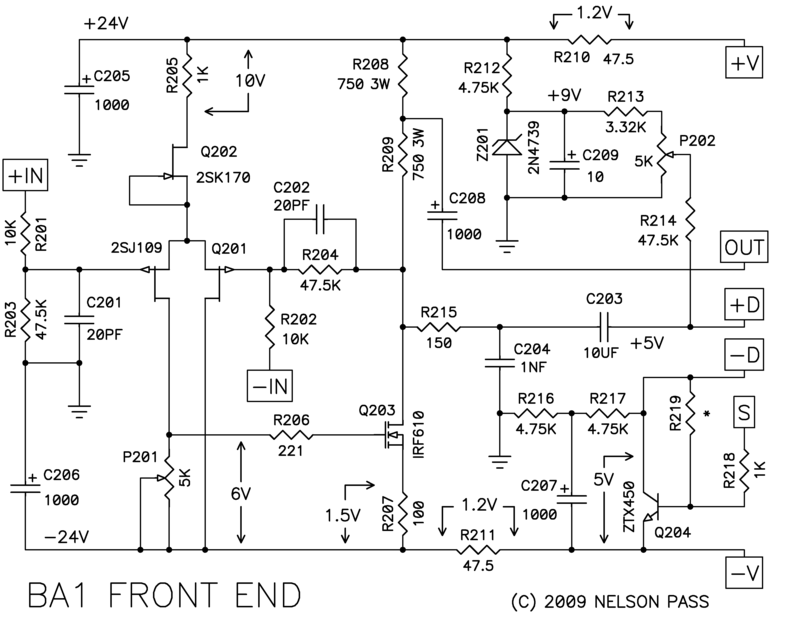 The purpose of this circuitry is to provide a positive constant bias voltage to the input of the bank of power Mosfets which sets their output to 0 volts DC. P202 is used to adjust this value. There is also a bias system for the negative half of the output stage formed by R216, R217, R218, R219, C207 and Q204. Q204 is a generic NPN transistor which sees the voltage appearing across the 1 ohm Source resistors of the negative half of the output stage and sets their value at about 0.6 volts, locking them in at a constant current value of 0.6A each. R219 is not ordinarily used here, but can be added if you need to reduce the current in an amplifier which is running too hot. If you need to use it, you can try values starting with 47 Kohm or so, decreasing the resistance for less bias current. All the usual comments about construction apply to this amplifier. The output devices should be matched for Vgs so that they share current well, and of course we note that all Mosfets are static sensitive until installed in the circuit, so they should be handled with reasonable care. Once in the circuit they are protected by Z101 and Z102. with some sort of “push-on-tab” heat sink. The power transformer should be rated at 600 VA or more. Two channels of this amp will typically draw in excess of 300 watts, and we allow at least a 2 to 1 transformer margin. Safety first: Use the smallest value Slow-Blow type fuse that holds up under continuous operation. Start with a 3A value and increase to 4A if necessary. When the amplifier is first fired up, it is best done without a load. At a minimum you will need a DC multimeter so as to separately adjust the DC offset figures of the front end and the output stage. Set P201 to adjust the Drain voltage of Q203 to approximately 0 volts. This value is not critical, as it is isolated from the output in any case. Then you want to adjust the DC output of the amplifier using P202, again setting it to 0 volts. After this you would be well advised to use the multimeter to confirm the various voltages which are shown in the schematics to confirm that they are nominally close to those values. You will want to keep an eye on the amplifier as it warms up, and you will end up re-adjusting the values of the two potentiometers. Heat sinks should stabilize at a temperature at which you can put your hand on the heat sinks for about 5 seconds. This is between 50 and 55 deg C, and is the ideal figure. As mentioned before, you should consider better ventilation or less bias if the heat is much greater. The measured performance of both stages together is comparable to that of just the follower output stage. Of course it now has voltage gain, and with that we see an increase in noise to about 70 uV. The bandwidth is slightly reduced to -3 dB at about 200 Khz. This extended bandwidth will make you expect a good looking square wave. This amp is really swell! I will also share that good measurements produced by simple linear circuits consistently sound swell. And why not? Tweaked over a period of time they usually can be made to sound even better, but that does tend to be a long process. You are invited to share your experiences in the official thread Burning Amplifier 1 here on diyAudio. A limited number of Burning Amp PCBs are available in the diyAudio Store! We're looking for more articles! Do you have an article that would be of interest to diyAudio members? Let us know! Last edited by Jason; 5th July 2010 at 07:01 AM. It appears an extra dot was added to the BA1 Output Stage schematic posted as the web page creating a junction between -D and R104 . The connection effectively shorts out the gate-to-source of Q102 keeping in cutoff. The connection does not exist in the PDF version. Yes this seems to be the case. Somehow the dot slipped back in! The pdf version is the correct one and we will correct this version as soon as possible..
Last edited by Variac; 13th July 2010 at 01:09 AM. I'm not sure your questions regard my comment but I'll try to respond. Nelson notes in the text that the coupling capacitor is a polypropylene making it a non-polarized device. The "+" sign near the capacitor belongs to the "+5V" reference indicating the voltage of "+D". He also comments in the text what is required if the capacitor left out. My original comment was to indicate a schematic typo. The correct version can be found by viewing the pdf version - go to the "Related Links" box on the right side of any page and click on "This article as a PDF" link. If your trouble continues I suggest starting a new thread topic. Am I right in thinking that the PCBs provide for three output pairs per channel, so each set provides a "half set" - stereo but half as many transistors as shown in the schematic?